First Men: Edwin E “Buzz” Aldrin showcases first-hand the event that took place on July 20, 1969. The place is the moon, and the photographer – reflected in the helmet of the subject – is Neil Armstrong. 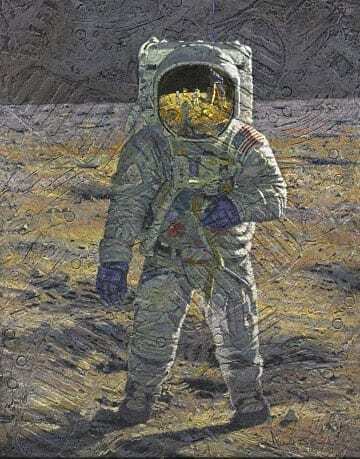 While the photo from which this painting is inspired is one of the most recognized moon shots taken, there was never a similar shot taken of Armstrong himself.